Jeff McCue, in the Newmarket Square office, on Wednesday looked over some department information along with retiring social worker Stella Hills-Thompson. Jeff McCue is a Lexus-driving, golf-loving millionaire whom Governor Charlie Baker tapped to run an agency that serves the state’s poorest residents. He says he wrestled with that image before he accepted the job in April as commissioner of the Department of Transitional Assistance, the agency that oversees programs such as welfare and food stamps. 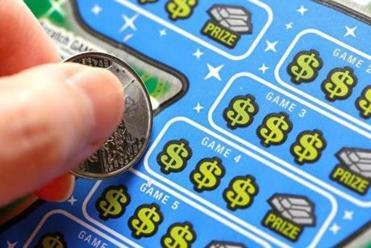 And he admits that sometimes during his 40-mile commute from his country-club home in Kingston, he wonders why he decided to go back to work full time after three years of very comfortable semiretirement made possible by winning the lottery. But ultimately, said McCue, 58, he wanted to serve, drawn by the challenge of maintaining the state’s safety net while helping families climb from poverty. He added that he is not as far removed from his agency’s clients as his circumstances today might suggest: 20 years ago, he was a single father of four children, struggling to keep it all together. 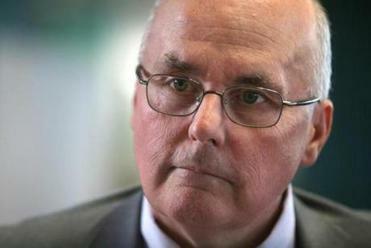 “I’m a very fortunate individual who has lived a modest life,” he said in a recent interview. McCue is an accidental millionaire, the result of a spur-of-the-moment purchase of a $20 scratch ticket while on the way to visit his son in college four years ago. His winnings of $10 million allowed him to pay the college tuition of his six children; buy his Lexus; and move from a modest house 3 miles from his parents in Weymouth to an estate at the Indian Pond Country Club in Kingston. He initially returned to his job, working for another year as the vice chancellor of human resources at the University of Massachusetts Boston, before retiring to a life of golf and part-time consulting. Paul Dietl, the state’s chief of human resources, has known McCue personally and professionally for more than a decade. Despite his sudden wealth, McCue has not changed, Dietl said. The son of an elementary school principal, McCue is an unpretentious family man who is just as happy to play golf at a municipal course as the championship links at Indian Pond. “I’m a very fortunate individual who has lived a modest life,” said Jeff McCue, commissioner of the Department of Transitional Assistance. McCue, gray and bespectacled, is a career bureaucrat who is returning to the agency where he started his state service in the 1980s. He served more than 25 years in state government under the administrations of Michael Dukakis, William Weld, A. Paul Cellucci, and Jane Swift. As the head the Department of Transitional Assistance, McCue oversees an agency used by one in eight Massachusetts residents through food stamps, welfare aid, or supplemental security income, which pays a stipend to the low-income elderly and disabled. In naming McCue to the $150,000-a-year job, Marylou Sudders, state secretary of Health and Human Services, cited McCue’s “talent to set goals and then build and motivate a team to meet those goals.” His first challenge has been fixing a $35 million computer system, built during the Patrick administration, that erroneously cut off or delayed food stamps to thousands of recipients. McCue is also charged with implementing new welfare policies enacted by the Legislature last year, measures that include increased fraud detection, financial incentives for employers who hire welfare recipients, and a “job diversion program” connecting welfare applicants to jobs. To advocates for the poor, McCue was a little-known, surprise pick. Pat Baker, senior policy analyst at the Massachusetts Law Reform Institute, an antipoverty group in Boston, said she had hoped state officials would choose someone with more experience dealing with the complexities of poverty. But after meeting McCue several times, she said she is impressed by his efforts to fix the food stamp problems and get benefits to people who need them. That fix, costing another $4 million, has included hiring 73 new caseworkers and a consultant, as well as paying workers to come in Saturdays to digitize a large backlog of documents. “We’re relieved that McCue is taking these issues seriously, versus pushing them under the rug,” Baker said. McCue grew up in Weymouth, one of three children. His father, George, was an elementary school principal and summer season pianist and entertainer at the Wayside Inn in Chatham. McCue said his father had a large following, including the late US House Speaker Thomas P. “Tip” O’Neill. McCue graduated from Merrimack College in North Andover, where he played lacrosse, and later earned a master’s in public administration from Suffolk University. After graduate school, he went to work as human resources chief at the state’s welfare agency, now the Department of Transitional Assistance, leaving in 1988 to become deputy commissioner at the state’s Department of Mental Health. Jeff McCue won $10 million on a lottery scratch ticket four years ago. In that post until 2003, he said one of his key accomplishments was helping to close state hospitals for the mentally ill in the 1990s by easing thousands of state employees out of their jobs without disrupting patient care. The closings, overseen by Charlie Baker, then the state’s undersecretary for health, continue to stoke controversy. While they allowed many people to live in community settings at significant savings to the state, they also have been criticized as mere cost-cutting tactics that led to greater homelessness and higher prison incarceration rates for the mentally ill.
During this period, McCue faced his own personal challenges. In 1995, his first wife died from stomach cancer, leaving him a single father of four children, all under 6 years old. He said he persevered with help from friends and his parents. His mother, in her 60s, came to his house each day at 6 a.m. to care for the children so McCue could go to work. McCue married again, to a hospice nurse with two children of her own, but never forgot the friends and relatives who helped his family when they needed it. “We had a tremendous support system,” he said. He said he also recognized that not everyone has such support, underscoring the need for the Department of Transitional Assistance. McCue, politically an independent, said he believes in the Baker administration’s priority of getting more people off welfare and into jobs. He admitted that it bothers him a bit to be viewed as a one-percenter, the term for those at the top of the US income scale, largely because he does not see himself that way. 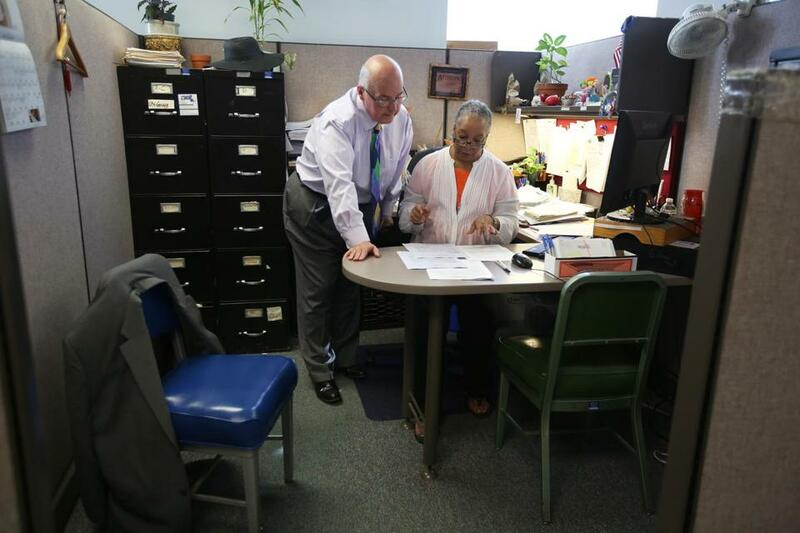 Jeff McCue, in his Newmarket Square office, on Wednesday looked over some department information along with retiring social worker Stella Hills-Thompson.